Baby Bracelets: Bracelets For Both Girls And Boys! Are you appalled to know about the arrival of a brand new member in the family? And constantly looking for the perfect way to cherish this occasion? Look no further! We got you covered. Here are 20 of the best baby bracelets out there to forge the bond of innocence with that lovely little being. 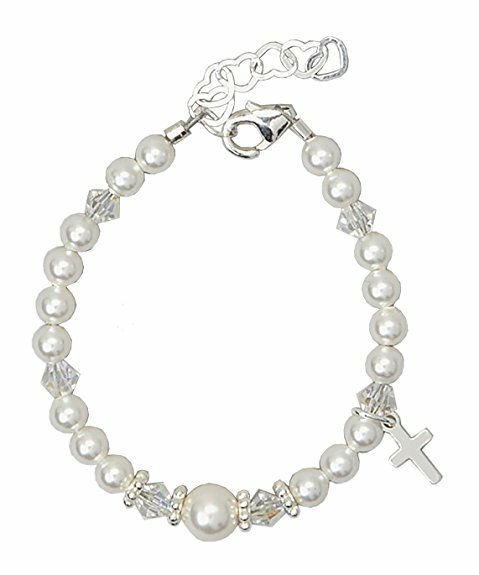 A pretty white bracelet to welcome the baby to this world would be this one from Crystal Dream. It has charm of the Christ, as well as crystals and simulated pearls. So the child can have blessings of the Lord and look gracefully stylish at the same time! The simulated pearls and clear crystals are from Swarovski. There are also sterling silver spacers and an inch-long extender chain of the same material to add to its style quotient. The chain allows it to grow along with the baby as time passes by. It is available for all age ranges up to 12 years. This includes even infants who have just been born! Imagine her happiness when she gets to know what a classic ornament she got to wear as soon as landing on this planet! For older kids, they can also wear it to a wedding or parties. To clean it up, simply use a cloth – dry or damp, both will work. However, never put it in the dishwasher as it will ruin the piece! 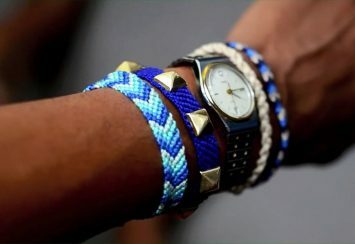 The bracelet comes at an affordable price range. Let the kids enjoy the royalty of gold plated jewelry from a very early age! If you prefer, you can also plate this bracelet with rose gold or 925 sterling silver. Enjoy any variation you want since each of them will charge the same. The design is kept simple and elegant with a minimalistic chain. It is made for babies aged zero to five years. It weighs only about 0.16 ounce and therefore will not be uncomfortable for the newborns. This bracelet also has an adjustable extend link whose length is one inch to grow with the baby. Other than that, it is about five inches long. It is meant for girls since the words “little princess” are engraved in it. It comes inside a white velvet pouch, as well as a gold embossed gift box and a beautiful white gift bag. 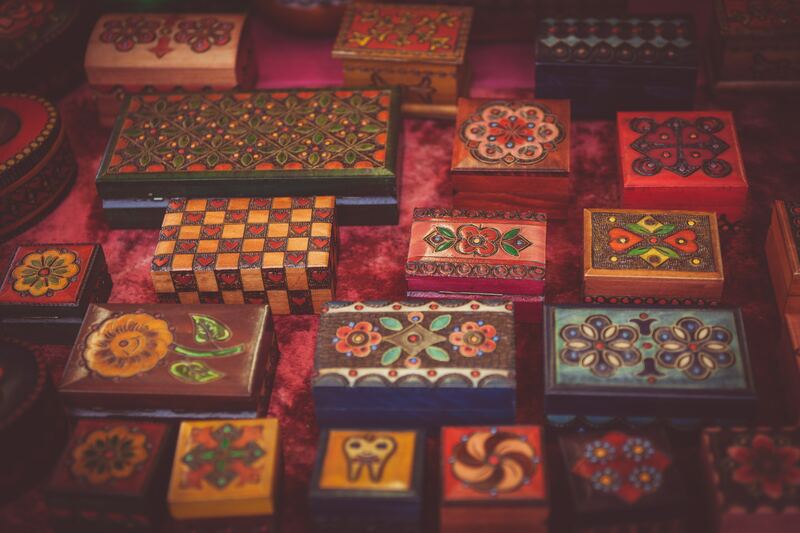 Thus you don’t have to worry about spending any amount of money on gifting packages! This one can also be bought with a very affordable price. 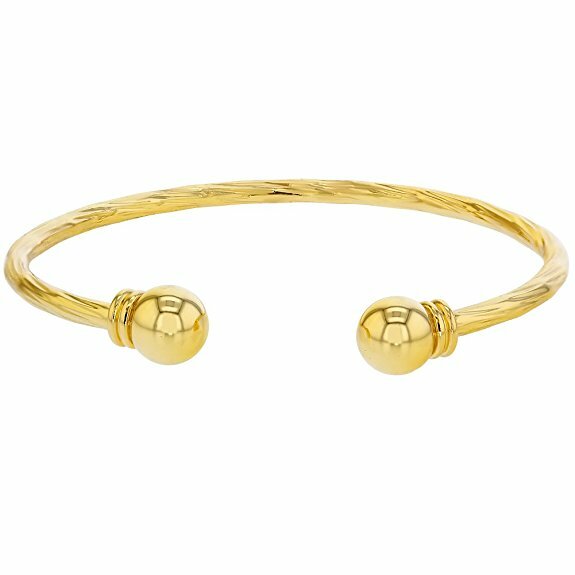 This cuff baby bracelet is plated with 18k gold and looks every bit of “royally stylish”. It looks wonderful on the little chubby hands of newborns and babies. Multiple sizes are not available for it since the bracelet can be resized manually by squeezing it tighter or expanding it wider. Due to its rounded ends, it is not prone to falling off the wrists accidentally. For the same reason, it can be taken off and worn any time without any difficulty! Even if it is worn every day, it does not get tarnished easily and holds its shape well. It is usually seen on female babies, but there are no specific restrictions for baby boys either. The length of this bracelet is less than an inch and comes with a money-back guarantee within 30 days of purchase. Its cost is pretty affordable so you can buy one anytime you are looking for an inexpensive gift solution! We love this bangle bracelet which is designed keeping elegance in mind. The base metal is made of brass and finished with gold. 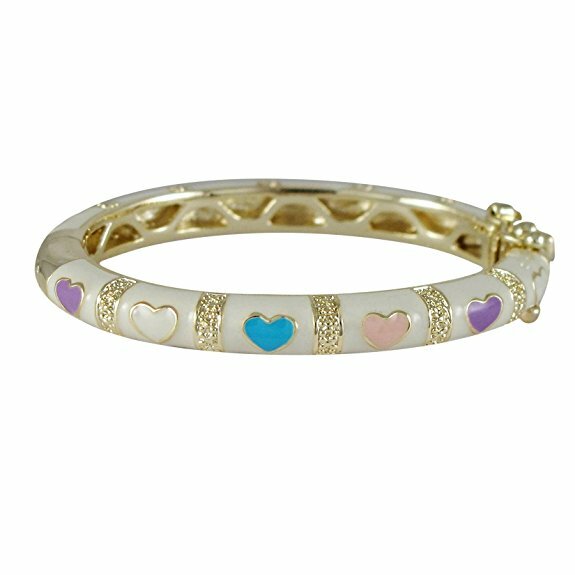 Then, it has been topped with beautiful glossy white enamel coating and a number of cute multi-colored hearts over that. They come in vibrant shades of blue and purple, as well as the pastel shades of pink and off-white. This balance between these colors is enhanced even more with the presence of gold bars between every pair of hearts. Such beautiful combination looks amazing on the young fashionistas and that is why it is available for a wide range of age groups. It can be found in various styles from 35mm to 57mm, so that even adults like their older sister or mother can wear the same bracelet pairing it up with the little angel. There are three clasps included in each bracele t- one box and two safety ones. It is not resizable and weighs only about 0.8 ounce. This bracelet comes in a sleek black box making it an eligible gift material and is not expensive at all! 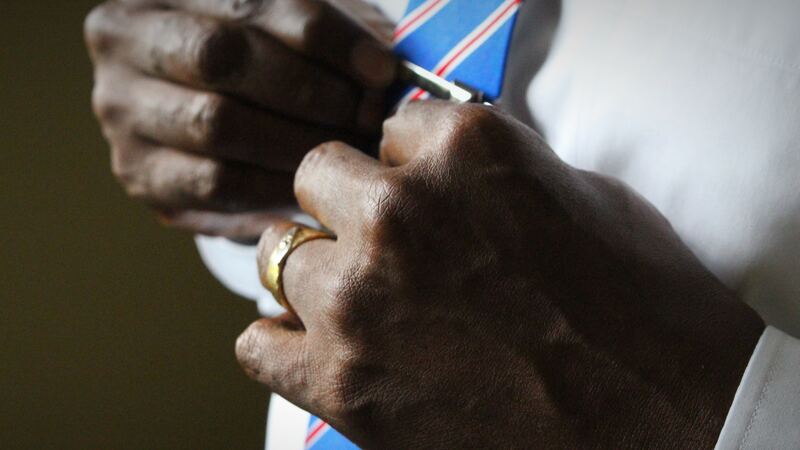 This bracelet has one of the simplest yet most valuable designs on our list. It is included in the Amazon Curated Collection which promises gold jewelries which can be worn daily and still last a very long time. The size of this bracelet is not usually large enough to fit kids over the age of two. Although, it can fit perfectly on the hands of a new-born baby and the touch of gold will give him or her a sense of royalty! For the same reason, this one is a lot more expensive than most other baby bracelets. It has a huge number of hearts embossed on the outer side with little dots aligned on the borders. This whole bracelet is made of 14 karat yellow gold and thus it doesn’t just look royal, it really is so. The material yellow gold is usually alloyed with silver and copper, which is why it weighs a bit higher at 1.6 ounces than other options on this list. Being hand-crafted from USA, it comes in a nice black gift box. The guard and hinge clasps ensure safety for the baby. Even scratching it will not reduce its beauty quotient since the marks barely show there. Babies and children do not require highly embellished or decorated ornaments to look beautiful! They themselves are gifts from God and look every bit of it too. 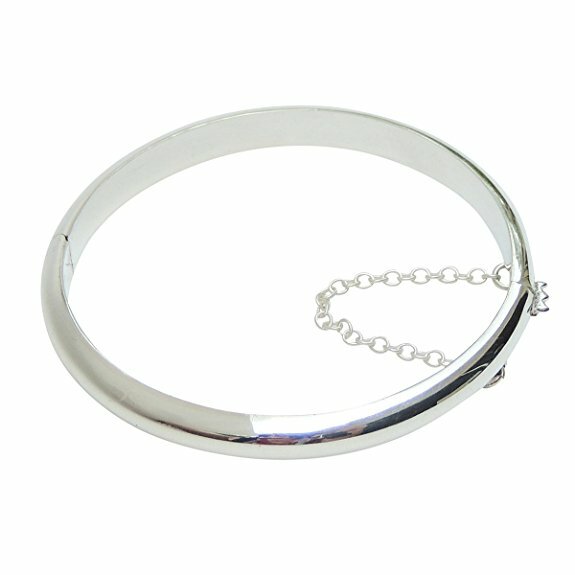 Keeping that in mind, Beloved Child Goods have made this bracelet which has the simplest design of a round silver bangle. They come in two sizes of “baby” and “child” which have inner circumferences of four inches and almost five inches respectively. The child ones can also be ordered in plain version or engraved version. The age range usually expands over between three months to five years. For infants however, there can be choking hazards. So babies in this age group need to be attended by an adult at all times. It is made of genuine sterling silver and gives the appearance of a classy shiny bracelet. There is a smooth hinge included in its design so that the baby cannot open up the bracelet by accident. You don’t need to prepare much to give it as a present to anybody since it comes boxed in a white organza bag and with a gift tag to write on! It is built in complete compliance with the Consumer Product Safety Act or CPSA and promises to give you the money back if you are not satisfied! What an amazing gift idea for any little girl! This one is a very special entrance on our list since this bracelet does not aim to stay in your little angel’s life for just three or four years! Instead, it wants to be with her till her wedding day! It is surely one of the most sentimental presents a baby girl and her whole family can receive on her birthday. 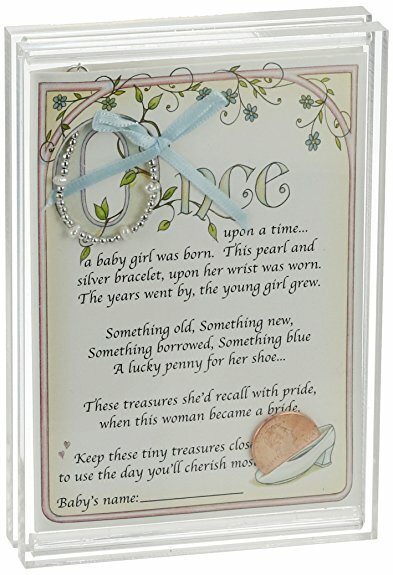 That is why this bracelet from Child to Cherish comes with an acrylic frame where a beautiful poem is written describing the transition of the baby girl into a woman in a few lines. On the back of this frame, there are detailed directions on how to use it on her big day. 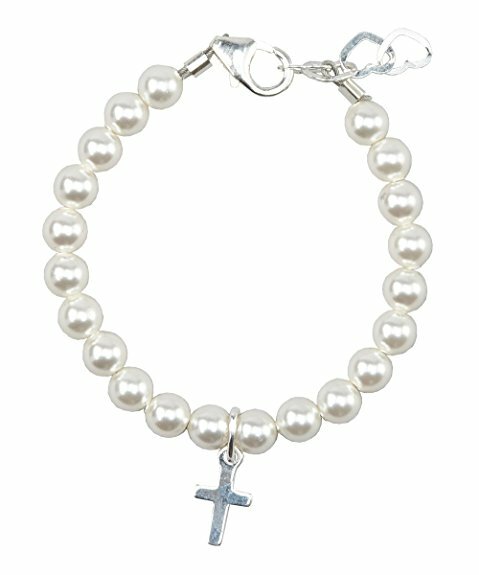 The bracelet is made of sterling silver and fresh water pearls. They are put together in such a classy and elegant way that no one can take their eyes off of them for a while. It is two inches in length and is obviously very durable. It comes packaged in a clear box and is pretty affordable. Crystal Dream brings you yet another pretty and elegant bracelet for baby girls! This one is made of Swarovski simulated pearls in pink and rose colors, as well as Swarovski crystals. So along with the classic elegance of pearls, the baby will also be getting some sparkles on her hand! 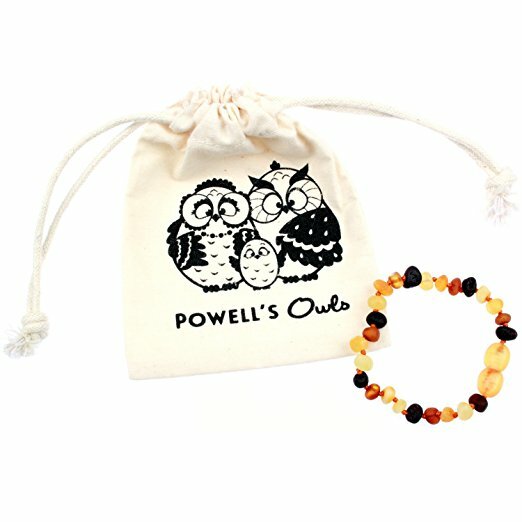 This bracelet comes in a variety of sizes from 3.75 inches to 6 inches, covering all age groups from newborn to 12 years! There is also one inch extender growth chain so that the bracelet can adjust its length according to the baby’s growing body. The lobster clasp and the base are made of sterling silver. All these parts have been put together and handcrafted by Brooklyn Mom. 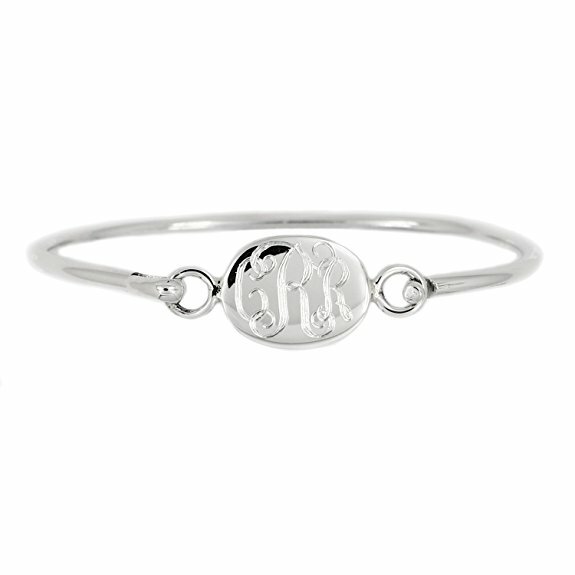 This cute and dainty bracelet is pretty lightweight at only 0.8 ounce! Moreover, it is not expensive at all and can be a good investment for anybody. This bracelet from LGU is made of sterling silver and portrays a very simple design which is perfect for babies. It consists of a thin base and an engravable oval surface only. Therefore, the weight is very light allowing a lot of comfort for the young wearer. Also, because of its simplicity and unisex design, both girls and boys can wear it. It is meant only for babies – infants and small toddlers, since it cannot be worn by anybody with a wrist wider than four inches. The bracelet itself is 4.5 inches in size and its oval surface is half inch long at the widest point. Its shiny look draws all eyes to the baby’s cute little hands every time! You can put any name in any font on the oval area, but make sure if you like how the monogram looks overall before confirming the order. The price for this bracelet is a bit higher than usual. Once it has been personalized, you cannot return the item anymore. One of the most beautiful and exotic bracelets on our list is this one from Lily Brooke Jewelry. The best part is it comes in twelve amazing colors, each representing the birthday month crystal! This color palette includes shades like sky blue, pastel green, dark green, baby pink, matte golden, dark purple, light purple, chocolate, blood red and more! 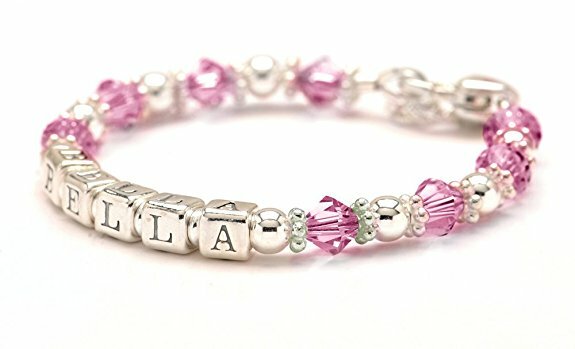 Moreover, you can have the baby’s name spelled out in letters as part of the bracelet! Each letter will be presented on a sterling silver bead in the middle of all the amazing crystals! A growth chain is also provided so that the baby can wear it for a long time as it grows from an infant to a toddler. There is a lobster clasp in the shape of heart making it look even more adorable! The size range expands from 4.5 inches to 6 inches. The bracelet comes in a Lily Brooke gift box so you don’t have to worry about wrapping it up right! Since it portrays all these amazing features, it’s no surprise that the price is a lot more expensive than the rest. This is yet another perfect gift for a baby on occasions like christening or keepsake. It incorporates the two elegant and creamy colors of pale pink and off-white. Their combination along with the transparent crystals and silver beads make up a really graceful piece of jewelry that radiates love, care and innocence. Like all other products of Crystal Dream, these are also handmade in USA by the Brooklyn Moms. The simulated pink pearls and white crystals are from the trusted brand of Swarovski. There are normal beads made of 955 sterling silver as well as a cross bead. The silver beads and the crystals both work as partitions between the pink pearls. It is available in different sizes from 3.75 inches to 6, since the makers wanted to bring this product for a wide age range of newborn to 12 years. The clasp is of lobster nature and a growth chain is provided of one inch length to support the growing baby. With all of these wonderful elements, it weighs only 0.8 ounce. The cost is also kept very cheap so that people of any class can afford it easily. This bracelet is made of big white simulated pearls from Swarovski making it one of the most eye-catching ones on our list. Despite such a high-class appearance, it actually comes at a pretty cheap price! There are different sizes available for this bracelet from 3.75 inches to 6 inches. Depending on the length, it can be worn by babies who have just come on this planet and also by kids approaching teenage at just 12 years old. To accommodate the continuous growth of their wrists, an inch-long extender chain is attached to the end. With the presence of lobster clasp, you can be assured that the infant will not open it up by mistake and cause any hazard. Because of its simple and graceful design, it is suitable on babies of all genders. There is a cross charm made of sterling silver to add to the already stylish look. It is a very delicate ornament for the equally delicate baby wrists and is a classic choice to wear on any occasion. Its weight is only 0.32 ounce so the baby will not feel any extra weight. Yet another creation of Crystal Dream is this bracelet which shows no compromise in terms of quality. These are also available in sizes for newborns to 12 year olds, traversing length of 3.75 to 6 inches respectively. 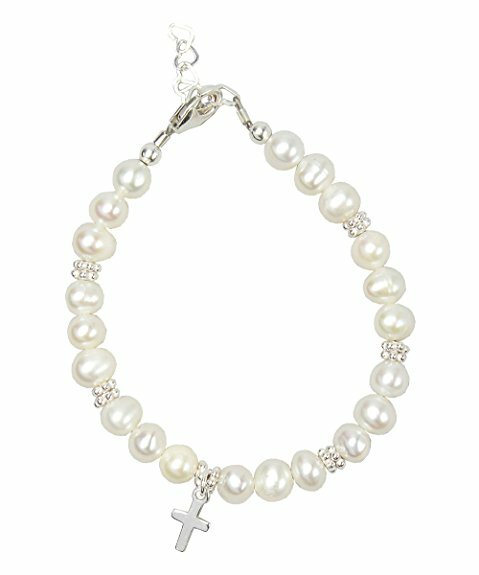 There is a cross charm included making it a very suitable gift for baptism, christening, keepsake and similar occasions. Similar to the previous one, this also contains big white pearls but this time there are 925 sterling silver partitions among each three of them. There are the usual lobster clasps included and the extender growth chain of one inch length. Each of these bracelets is made maintaining the safety standards and in compliance with the CPSIA and CPSC demands. The components used here are completely free of harmful substances like BPA, lead, PVC and phthalates. They weigh only about 0.32 ounce and thus is perfectly light for the delicate baby hands to carry. Its elegant design allows both boys and girls to wear the bracelet. The little angels can wear it even during their bathing time! These bracelets come packaged in a clear pillow box and costs a bit higher than usual. 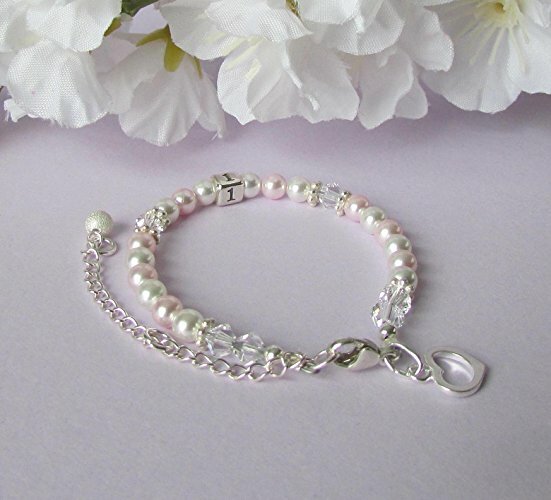 This is the second “baby to bride” bracelet on our list and is obviously meant for the little girls who will grow into beautiful brides one day. Since it is made to accommodate an adult’s wrist too, you can buy one for yourself if you like it too much! This adjustable growth is allowed by the provided long growth chain with a white ball in the end for some added style. It looks very fashionable with clear crystals along with white and pale pink pearls from Swarovski. They are separated in groups by block heads and spacers made of high quality 925 sterling silver. The clasp and heart charms are also made of the same material. For all these top-notch components included, it costs pretty expensive. In terms of packaging, they come with two options for you – one is pink themed and the other is silver. For the first one, the bracelet comes in a crystal bear with a pink heart. These are kept in a box which is pink and have white patterns on it. The silver box includes a heart-shaped box whose top is exquisitely designed with details and white stones. 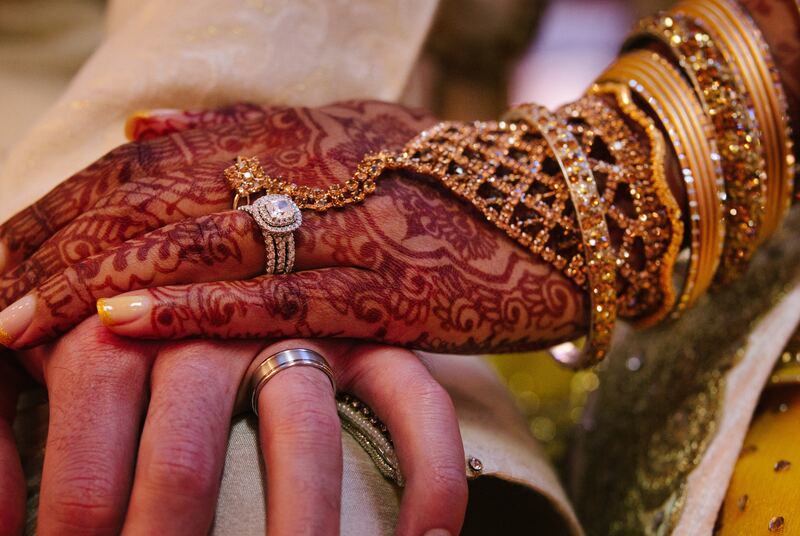 On her special day, the bride can wear this bracelet or weave it into the bridal bouquet. You can then read her the poem written inside a card inside the package. Be ready for the happy tears! One of the cheapest options on our list is this one where a number of freshwater cultured pearls are lined up for a classic and elegant look. The color combination of 14k yellow gold base and white pearls makes the baby look like a royal heir ready for the throne! 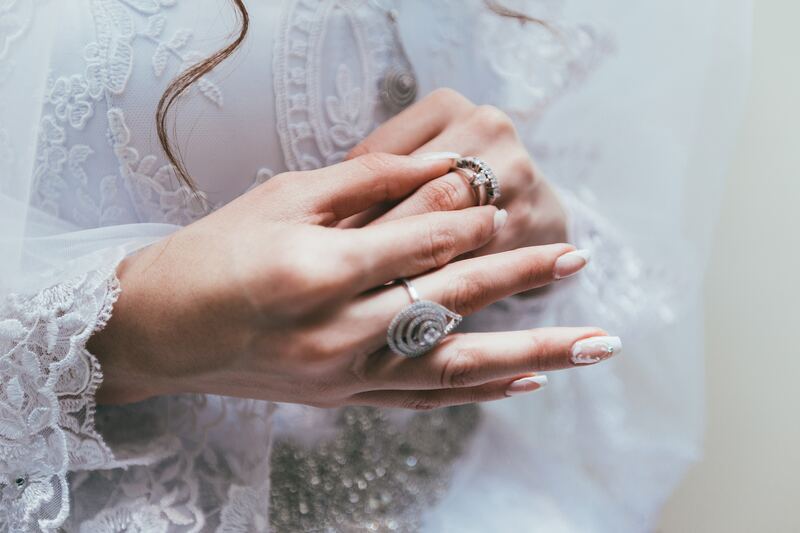 The spring-ring clasp makes sure that the princess does not take it off by mistake and thus prevents any undesirable accident. It is made in the USA and weighs very little, just 0.32 ounce to be exact. Hence it can be worn daily by the baby without any difficulty. After an avalanche of colors like silver, white and golden, this baltic amber bracelet brings a breath of fresh air! It is multicolored where beads in shades of brown, black, pale yellow and pale orange are lined up. Because of this color combination, it can be used by both male and female babies. Each of these beads is unpolished and 100% natural baltic amber. It is 5.5 inches long and has been tested in the labs for safety. It has been made through a completely chemical-free process with the help of small pine pieces. Don’t believe us? Check out the verification from world’s leading authority in gemology – the Gemological Institute of America. This bracelet not only looks stylish but can also bring pain relief from teething within 15 to 30 minutes. It contains succinic acid which reduces swelling of gums and boosts immune system at the same time. Besides, it also reduces drooling and fussiness. 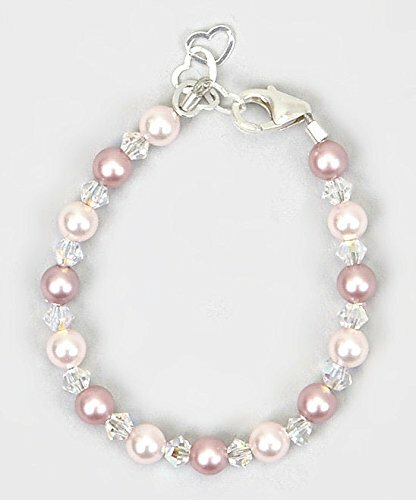 There is a screw clasp to stop the baby from opening up the bracelet and also, two knots are applied around every bead to prevent choking hazards. Even if all these features don’t satisfy you, there is a 30-day guarantee which will allow you to get all the money back. Since it costs really cheap, you can buy one any day and see how it turns out! This one is also made of baltic amber but here all beads bear the same honey color which is considered to be the most popular shade. The material is certified to be 100% natural amber right from the Baltic Sea of Lithuania. On the 5.5 inches long base, a number of baroque style round beads are accumulated. As a result, the baby can get that stylish bohemian or casual look from a very early age! Due to its simplistic design and not-so-feminine colors, the bracelet suits both girls and boys. These beads contain 3-8% succinic acid, which we all know is helpful for the baby’s dental health. The shape of the beads may not always be completely round since they are all natural and unpolished. The beads are free from BPA, phthalate, latex and lead for maximum safety of the child. It weighs very little at just 0.16 ounces and is therefore one of the lightest baby bracelets. There are plastic screw clasps which can be assembled together. The beads are bound to each other by a silk threaded string and is knotted between each two. So if the bracelet tears apart, all beads will not scatter around at once. Make sure it is worn under the clothes so that the baby cannot chew on it and the thread does not break off. Remove it during sleep and bathing since the silk thread can be damaged that way. The surprising thing is, with so much going for it, this bracelet costs almost the cheapest on our list. One of the simplest, cheapest and most lightweight bracelets is this one made in Texas. There are two chains on both sides of the solid plate in the middle where you can engrave the baby’s name or any other word you want! This whole bracelet is made of copper and can be plated in 16 karats gold, rose gold or silver. The length of the plate itself is just three quarters of an inch, while the chain can be from 4 to 6 inches depending on how you adjust it on the baby’s wrists. Since the design is so plain and straightforward, it will look good on both girls and boys. It suits babies who are just born up to infants aged a year. Even though a lobster claw clasp is provided, the baby needs to be under adult supervision at all times to prevent any choking hazard. Out of all the baby bracelets, this one has the most unique design. It is overlaid with gold and has a solid bar in the middle. 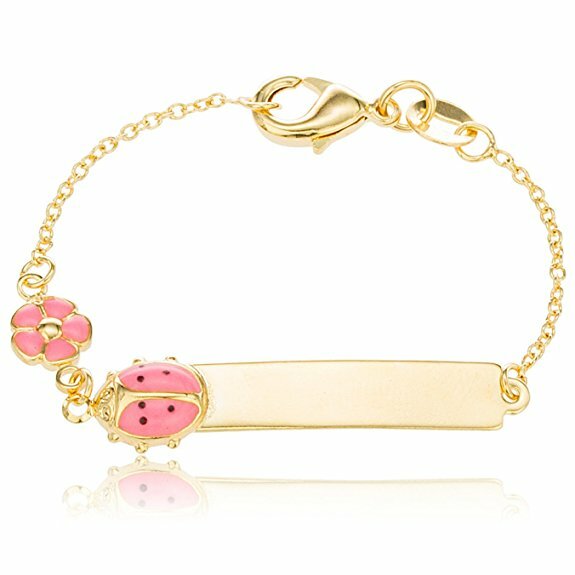 But on one side of this bar, there lies a pink ladybird looking at the pink flower charm just above it! The minimalistic yet eye-catching design is sure to make the guests take more than one look at the baby’s wrists. It comes with a two-year warranty and weighs about 0.32 ounce only. It is available in two sizes of five and six inches. This bracelet can suit baby girls up to the age of two years and it is the cheapest one on our list! Even the last one on our list is from Crystal Dream! Who could have guessed? 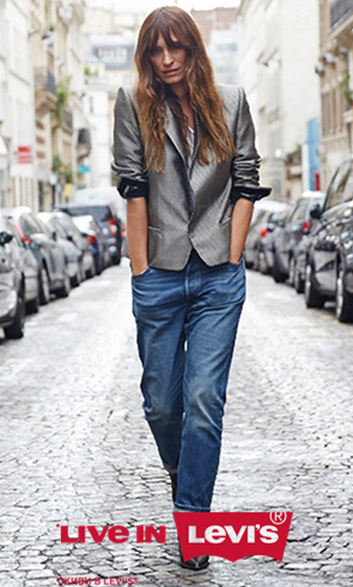 This is the most stylish one from them without a doubt. 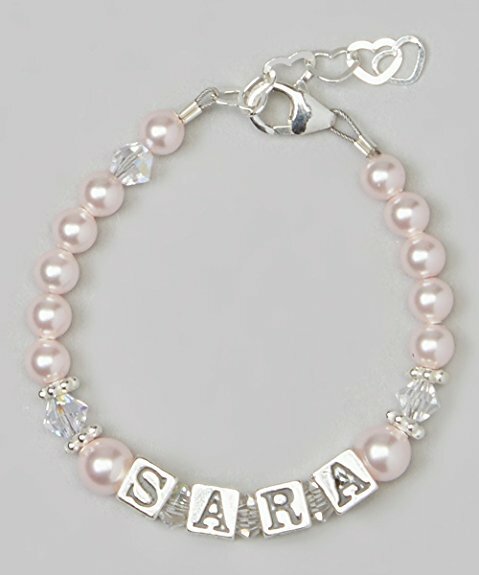 That is because, this piece includes pink simulated pearls and crystals from Swarovski along with a number of letter blocks spelling out the baby’s name. Even the charming chain in the end is a bit different from the usual since it has hearts lined up instead of the generic oval rings. It weighs a little more than usual at 2.08 ounces but that is totally worth the style it comes with! It is available in a variety of sizes from 3.75 inches to 6, covering the age ranges of just born to 12 years. Due to its beautiful design, this pretty, well-made and substantial baby girl bracelet comes at a bit expensive price. How to Use Them and Take Care of Them? Keep the bracelet away from hair spray, body lotion, deodorant and any other product of this sort. Store it in a cool area if the bracelet not meant for daily use. In such case, also keep it away from extreme heat, sunlight and sweat. You can wrap it in a tissue or some other soft fabric to stop it from getting scratches. Unless the bracelet is of the teething kind, always keep the baby under adult supervision when he or she is wearing it. Otherwise, the child’s teeth and gum can get hurt or the ornament can get damaged. If it is made of any plated material, never gift it to a baby with sensitive skin. Because doing so can cause allergic reactions immediately or over time. Clean it on a regular basis with a cotton ball or soft cloth to get rid of the daily dust, preferably after each use. 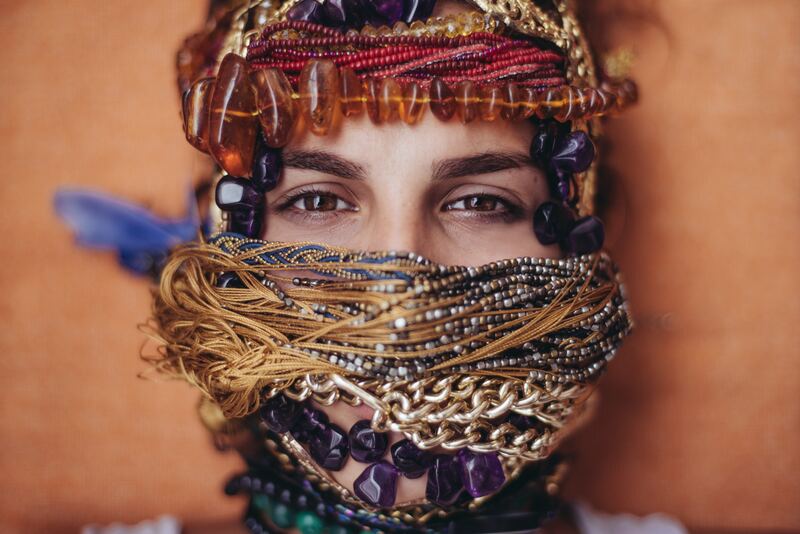 Apply the ball or cloth on each bead and if it is waterproof, cleanse it with spring water. In case the bracelet is already stained or tarnished, use jewelry cleaner or toothpaste on it to bring back the shine. 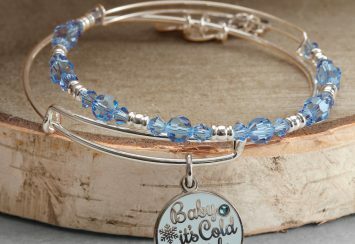 We hope you and the baby both giggle as soon as he or she sees the bracelet! It is a great way to start a new and pure bond with a kid, as well as to welcome the little angel to this planet. With all our good wishes and blessings, these little humans will surely make the world a better place once they grow up! Bracelets The Most Unique Friendship Bracelets We Found Around & They Seriously Rock! Bracelets Our Top 15 Alex and Ani Bracelets for 2018!